It feels like it’s taking forever for October and Doctor Who Series 11 to arrive. I haven’t felt this stoked about a new series of Doctor Who in quite some time, but I’m on edge for its arrival! A couple of weeks ago, we finally learned the air date of the first episode: 7th October. The BBC also released a short teaser trailer to go with the announcement. Bizarrely, despite being called a “Release Date Trailer”, the YouTube version (which I’ve embedded just below) doesn’t actually include the date! The date is included on the version loaded to other platforms though. The teaser contains a fun little nod to breaking the glass ceiling, which, predictably, upset a certain subset of fans. The date marks a move to Sundays. With the exception of Christmas specials and “The Waters of Mars” (which was also a special, though not a Christmas one), since Doctor Who came back in 2005, it has always aired on Saturdays (though at highly variable times in the UK in recent years). The classic series usually aired on Saturdays as well, except for a few seasons in the 80s. Here in Canada, Saturday has always been the typical night as well—although YTV showed the Sylvester McCoy years on Sunday evenings in the late 80s, so Sunday won’t be completely unprecedented for me. It will seem a little strange at first, though. However, the air date is not the main purpose of this post! Now that there are only a couple of weeks left before Series 11 starts, the marketing campaign it starting to get into full swing. Over the last couple of days, there have been a lot of newspaper and magazine articles released containing interviews and hints at what to expect—though this year’s pattern of providing far less information than in previous years continues and I like it! And today has seen the release of a new full trailer! This trailer is the first to include a bit of actual dialogue from the new series, as well as brief glimpses (mostly blink-and-you’ll-miss-them glimpses) of guest stars and monsters, including a giant spider! I will admit that the music grated a bit when I first heard it in the Release Date Trailer. It’s very atypical for Doctor Who. However, it’s kind of grown on me. The lyrics fit, and it actually works really well in this new trailer. It does drive home the point that this is a new era of Doctor Who. Things are going to change. What I particularly love about this trailer, though, are the visuals! Much like the previous full trailer, this one highlights some absolutely gorgeous visuals, and it has a truly cinematic feel to it. The new aspect ratio helps a good deal in this regard. 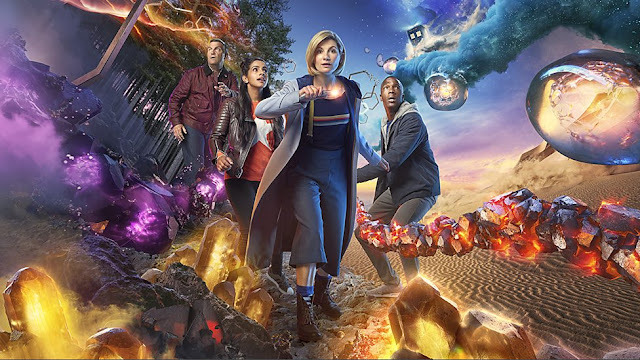 Series 11 looks like it could be the best visually appearing series of Doctor Who ever. I can’t wait! Anyway, to finish up, here’s a fun video of Jodie Whittaker responding to tweets about her casting!